Portable stands for small to large birds. Convenient for travel or just to hang out in the house. Complete with Chew toys, this gym is recommended for small to medium birds. This large multi-bird lay gym has two floors. The lower base is approximately 14" x 18". The top base is 10" x 14". Total height is 20" tall. Easily transported, too! Photo courtesy of Sunny and her mom, Jennifer, from Wisconsin. Sunny is an adorable pied cockatiel. 1" Diameter X 6"; Perfect for babies just learning to perch. 1" Diameter X 8"; Perfect for smaller birds. Polly's Mini Stand Training Perch. Allows for adjustable perch heights. When inverted, it becomes a rocker for your bird! Comes with cup. 7/8" Diameter X 6" Perfect for babies just learning to perch or smaller birds, such as budgies, parakeets, lovebires, parrotlets and the like. 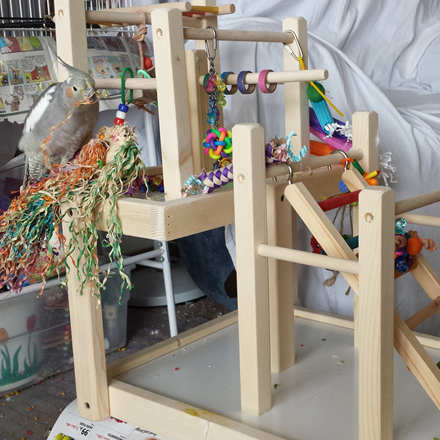 Polly's Portable Stand is a secure, colorful platform that creates an ideal resting or play area for most all birds. 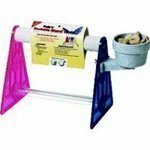 This multi-purpose stand provides a feeding stand for baby birds, helps train babies to perch and is easily portable to move around the house or take when traveling. It features a rough cement perch that trims your bird's nails naturally and has 2 adjustable heights, 1" or 9" from the surface. Includes a feeding cup. Made in the U.S.A. with a durable, nylon-polymer material.